The Alea in Leeds hosted our West Yorkshire regional final which awarded seven semi final seats. Our fifth Yorkshire Vegas 100 member would also be known before the day was out. Last season’s champion, Gary Stride, was present but couldn’t equal his performance three months ago as he exited in 87th position. The Flying Man in Pocklington claimed their first team event title and supplied one of our finalists in Richard Carlton. Adam Brown, Andy Turner and Richard Pouton also represented the pub. 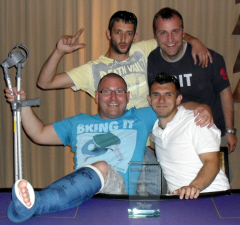 Our West Yorkshire final table produced the comeback of the weekend as short stack Alan Tate was not as dead and buried as you may have thought. With all finalists guaranteed a semi final seat, Ian Milne was the first player to exit and collect his seat as Sam Sheppard 7th, Martin Winpenny 6th, Ryan Keane 5th, Danny Sillitoe 4th and Richard Carlton 3rd all collected theirs too. 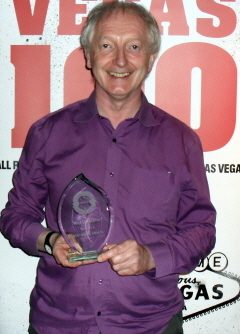 This left Alan Tate and Dave Peat to contest the Vegas 100 package. Alan’s pre-flop advantage was cemented post-flop as his J-5 became top pair to Dave’s 3rd pair holding 6-7 on a 6-8-J flop. The 4 turn and A river changed nothing as Alan Tate became the newest West Yorkshire regional champion. Well done!